A Hull engineering firm has launched a new support service for staff with mental health issues after figures showed they work in one of the most at-risk industries. Spencer Group has recruited a network of mental health first aiders and champions, as part of its commitment to ensure employees don’t suffer in silence. It comes as part of Time to Talk Day, on Thursday, February 7, which encourages people to speak out about mental health. The male-dominated engineering sector has one of the highest suicide rates in the country. Every two days, one employee in the industry takes their own life. Yvonne Moir, HR director at Spencer Group, said: “At Spencer employee engagement is not about statistics and initiatives, it’s about the people who work here knowing they have support from the business and their colleagues when they need it. “Having mental health first aiders and champions in place shows the commitment of the business to making it OK to talk about mental health wellbeing. “It should never be a taboo subject and no-one should ever be afraid to tell their employer that they need help. 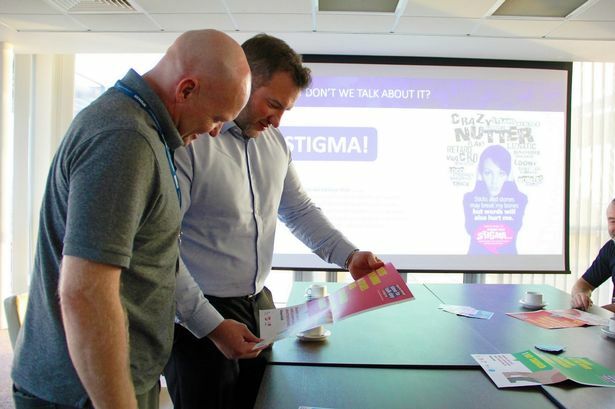 Time to Talk Day is part of the Time to Change movement, led by the Mind and Rethink Mental Illness charities, which is working to tackle mental health stigma and discrimination, including in the workplace. Issues of mental health wellbeing are particularly acute in the engineering and construction industries, in which many workers spend long periods of time working away on high-pressure projects, isolated from their families and friends. The male-dominated sectors also traditionally have a “macho” culture, which discourages workers from sharing their problems or concerns. These factors contribute to alarming rates of suicide among construction workers. Between 2011 and 2015, more than 1,400 construction workers in the UK took their own lives, the highest number for any profession, according to the Office for National Statistics. Research commissioned by Public Health England in 2017 also found men working in construction are at the highest risk of suicide, with those aged above 40 the most vulnerable. Spencer Group has launched a new mental health wellbeing area within its internal online portal, and is encouraging employees to access and use the support and information available. The firm has also teamed up with Hull mental wellbeing tech firm Moodbeam, to make the wearable device available to employees experiencing mental health issues. The Moodbeam device will provide individuals with confidential data to help them understand issues affecting their mental health wellbeing. A dad whose son took his own life aged just 20 is now using the experience to make sure his colleagues don’t suffer in silence. Wayne Gammon, a sub agent at Hull engineering firm Spencer Group, had just returned from a family holiday in France with his son Christopher when tragedy struck in 2004. Christopher left home suddenly one day, and never returned. His body was discovered by a farmer the next day. The death left Wayne blaming himself for the tragedy, but 15 years on, he has now become a mental health champion at Spencer Group, to help fellow colleagues speak out about how they are feeling. He said: “My first thought when it happened was why. Then as a parent you start to blame yourself for what happened. “I thought, what was the point in staying with a family if I cannot even protect them? Wayne had been working at his previous company for almost three decades at the time, and admitted he returned to work too quickly after Christopher’s death. What happened next however, left him shocked. “I was the transport and distribution manager at the business, so I felt I had a responsibility to my team as well as my family,” Wayne said. “I was back at work, but I was not productive and just sat in the corner at my desk and cried. Wayne went on to join Spencer Group in Hull as a labourer, but rose through the ranks quickly and is now a sub agent at the civil engineering firm. He has had one further breakdown at work since joining the business, but received a very different response. The company encouraged Wayne to take time off, funded counselling sessions and enabled him to make a gradual and supported return to work. He has recently become one of seven mental health champions at the business, using his personal experiences to help others.